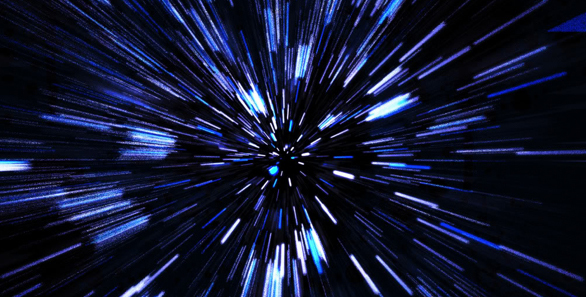 There are good chances that PNN, besides the amazing potentialities we’ve covered in previous post, can break the ultimate barrier: the speed of light. Will PNN be the key for FTL travels? Let’s discover how it might be possible..
First we must know why, with our current technology, the speed of light (from now on “c”) is far away from our reach. The Special Relativity equation for the kinetic energy E = mc2(1/(1-v2/c2)1/2 -1) tells us that when the speed v equals to c the value of E becomes infinite, and an inexhaustible energy source is definitely one thing that mankind does not own. Then we must consider the concept of Work: in order to obtain a displacement in space the kinetic energy must be transferred between two systems through the action of a force. In an hypothetical rocket that tries to reach c using conventional propulsion this transfer is made through the reaction force, so the kinetic energy is transferred from expelled mass to the rocket mass, according to Newton’s Third Law. This means that this rocket will require an infinite amount of fuel to reach c.
Let’s consider now the physics anomaly of a PNN-E ship accelerating to c: since the engine does not expel mass its Work is null but nevertheless the speed is increasing and so it is for the kinetic energy of the ship.. but meanwhile the energy source is not depleting! This means that more the ship accelerates more its total energy increases, in evident contrast with the Energy Conservation Law! ASPS speculates that since the energy can’t decrease, something else must. I add that given the famous formula E = mc2 this something can be only c or m. Whatever will be, the implications are unthinkable: maybe once the whole ship reaches c it slips into a tachyonic state loosing all its mass.. but I’m fantasizing.. The more rational hypothesis from ASPS is that the resultant of internal forces of the system is not zero: this way the Work is not null too and therefore there is an energy transfer that somehow balances the total energy and thus the Energy Conservation Law is respected. But how fast the PNN can fly? With the second hypothesis the PNN is more similar to a Stargate than a thruster, and the only limit to our knowledge of the universe would be the choice of which places to visit! ..or will it rather be a Stargate? The researchers say that those are two extremes and the truth could be somewhere in the middle. The only way to discover the true potential of the engine is to put one thruster in orbit, set full throttle and see what happens..
non conoscevo il QEG perché non seguo molto il mondo della free-energy. Ho dato un’occhiata veloce al link, appena ho un po di tempo lo leggerò meglio. Secondo me, visto che una caratteristica della PNN è quella di esserè affamata di corrente elettrica,il QEG potrebbe andare bene se riuscisse a fornirla a dosi elevate mantenendo dimensioni contenute. Purtroppo queste tecnologie sono spesso in fase embrionale (penso al Polywell) e perciò la vedo dura. Dopo che è stato deluso dall’Ecat Laureti sembra orientato verso la fissione nucleare, in particolare ai generatori a radioisotopi come quelli montati sulle sonde. Eh si, purtroppo in Italia abbiamo votato contro il nucleare. La overunity e’ anche low-cost. Neanche io mi dedico alla free energy, pero’ e’ vero il QEG si puo’ dire in fase embrionale, anche se e’ descritto e dettagliato e si puo replicare.